From Japan, comes a yokai of pure wrath, the Wanyudo. One oldest Yokai around for over a thousand years, the Wanyudo was once a Hein Era nobleman who mistreated his townspeople, up until he was assassinated during an ox-drawn cart tour of his city. He came back for vengeance as a enraged head attached to a flaming wheel, driving a path of violent fury on the streets of larg cities. The Wanyudo is so feared that even catching sight of him would case either extreme fever or death, and death can come either by his gaze or being run over and torn apart and left a smoldering heap in its wake as it continues it city-wide tour of various cities. An urban legend of the Wanyudo's fury was a mother dared to take a peek as the Wanyudo rolled into her city. her life was spared, but she saw tiny, human limbs dangling upon its fiery spokes. The Wanyudo, reportedly roared at her, " If you have time to gaze upon me, tend to your own child!" And when she turned to her child she saw, to her horror, that his legs were reduced to charred, bloody stumps. To survive an encounter with the Wanyudo, you must lock you doors and stay in until daybreak has come, as the Wanyudo withdraws at dawn. Never peek at the Wanyudo, even on a dare, it is not worth your life to see it, which begs the question; who saw and survived it to give a description for Seiken Toriyama's "The Illustrated Demon's Night Parade", THE guide on all things Yokai? Back to my previous statement, avoid looking at the Wanyudo, and even if it passes by your home, do not go outside, as the Wanyudo could just be making another pass by, or trapping any curious or unwitting humans to trample on into human briquettes. Another method is to paste ofudo strips onto your doorway with the words "kono-tokoro-shobo-no-sato" to keep the Wanyudo at bay. 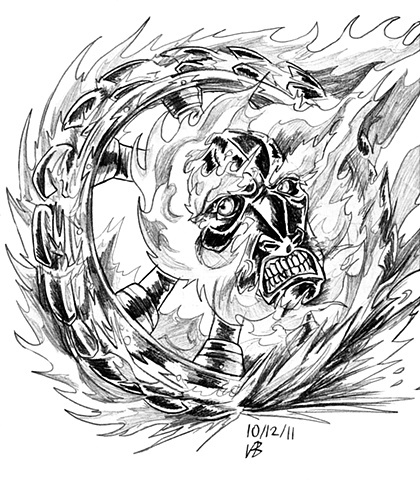 For my render of the Wanyudo, I drew the enraged face, while using heavy darks to indicate a being blind with rage with fiery hairs and eyebrows attached to a more mechanical flaming wheel with treads that spews its flames worse that a Ghost Rider joyride.